What is life in Toronto like? How does the cost of living in Toronto compare with other cities? After moving to Toronto, how easy is it to settle in? This guide will help you address some of the questions you may have about living in Toronto. When you’re done, be sure to read the rest of our Moving To Toronto city guide for further research. Toronto, the provincial capital of Ontario, is located on the northwest shore of Lake Ontario. Toronto is in Southern Ontario, with the province of Quebec to the east and the American states of New York and Michigan to the southeast and southwest, respectively. It takes less than two hours to drive to the US border at Buffalo, NY. With a population just short of 3 million people, the city of Toronto is the largest in Canada, and one of the largest in North America (behind only Mexico City, New York and Los Angeles). The Greater Toronto Area (GTA) includes around 6.5 million people, stretching along the shore of Lake Ontario and including suburban communities further inland. Although not the capital city of the country – that particular honour rests with Ottawa – Toronto is nonetheless the centre of many of Canada’s industries, and therefore it offers many economic opportunities to new arrivals. Create a Moving2Canada account to prepare you for life in Toronto, and get a copy of our FREE Getting Started Guide! Life in Toronto wouldn’t be the same without the weather. You can depend on experiencing all four clearly defined seasons in Toronto. While winters aren’t as extreme as many other parts of Canada, they can still be quite severe, and frustratingly long. Expect around four months of winter weather from December to March, inclusive. Temperatures can drop as low as -20 degrees Celsius before wind chill is factored in, so a proper winter coat and boots are an essential purchase. Outlet stores, such as the one in Vaughan Mills, sell winter coats and boots at greatly reduced prices when they are out of season, so if you can take the time to visit there during spring or summer you can save yourself a couple of hundred dollars. There tends to be quite a short spring season in April and May before the summer heat kicks in. Toronto can get quite humid during the hot summer months, so if your house or apartment doesn’t have air conditioning built in, then buying a window air-con machine is a sound investment. A store like Canadian Tire sells them at varying prices. Living in Toronto, particularly anywhere near downtown, can be expensive. Rents are among the highest in Canada, and other standard monthly expenses such as phone plans, groceries, and transit are not cheap either. Analysts at LowestRates.ca calculated that to get by in Toronto a person needs to be earning a salary of $40,583 (before tax) to meet the living costs of the city. Fortunately, wages in Toronto are also quite good across the spectrum, and the provincial government has passed legislation that raised the minimum wage in Ontario from $11.60 per hour to $14 per hour as of January 2017. A planned increase to a minimum wage of $15 was shelved following a change in the provincial government in 2018. A pint of beer in Toronto can cost you between $7 and $10, depending on where you are. Tipping is expected; a dollar per drink is a decent guide if you are buying from the bar, or if you’re running a tab somewhere between 15-20% of the overall bill is the norm. It’s also worth bearing in mind that when you secure a lease on a house or apartment, it is likely to come unfurnished. That means you will need to factor in the cost of obtaining all your furniture as well. Toronto’s ubiquitous streetcars form part of the city’s identity. Living without a car is advisable for many people living in Toronto, and most people manage to get by without owning a vehicle. Fortunately, public transit, run by the Toronto Transit Commission (TTC), is very comprehensive and can take you just about everywhere you need to go in Toronto. There are two main subway lines: Line 1 goes north/south, and Line 2 goes east/west. There are two additional, shorter lines on the outskirts of the city: Line 3 to Scarborough and Line 4 to Don Mills. Subways run frequently, as often as every two minutes in rush hour and about every five minutes at other times. Service runs approximately 6 a.m. to 2 a.m., with an 8 a.m. start on Sundays. There’s a full system map including the bus and streetcar routes here. A monthly pass costs $146.25 and gives you unlimited travel on the TTC for a calendar month. You can buy these from the collector’s booth at any station. A single fare costs $3.25, so you’ll need to be making 45 trips per month, or 12 per week, for it to be cost effective. For most people working five days a week, it’s worth your while. The TTC has discounts for students and seniors. You can see its list of fare prices here. The TTC is in the middle of transitioning to a new fare payment system called PRESTO. If you’re new to Toronto, you may as well get on board with it now, as from 2019 onwards it will be the only way to pay your fare. The PRESTO system is also in used in other transit systems in Ontario, such as Brampton Transit, MiWay in Mississauga, Go Transit, and York Region Transit/Viva. A PRESTO card costs $6, and you can top it up online, over the phone, at some Shoppers Drug Mart locations, or at reload machines at some TTC stations. There’s a lot more information on the PRESTO system here. Once you have credit on your card, you tap one of the readers when you enter a bus, streetcar, or station to pay your fare. It’s also possible to upload a monthly pass to your card, and daily cap limits are scheduled to be be introduced later in 2018. Another benefit of the PRESTO card is that you can create an online account, so if you happen to lose your card you can simply cancel it and transfer your balance over to a new card online. If you are commuting in from suburban areas such as Mississauga, Brampton, York Region or Hamilton, you can catch a Go Train or bus – these run to Union Station in the heart of downtown Toronto, and from there you can connect to the TTC. Public transit is cheaper and more convenient than having a car, for which you’d have to pay insurance, gas, regular maintenance, and city parking fees. Parking spots are hard to come by, and you’ll need a parking permit from the City for your neighborhood. The cost varies depending on where you live but expect to pay upwards of $200 for anywhere even close to downtown. Some Torontonians forego the option of owning a car, but frequently use one of the many carsharing options in Toronto. As of 2018, Lyft has moved in to Toronto to offer some competition to Uber for cab rides. Both are quite reasonably priced compared to city taxis. Toronto is a wonderful place to bring up kids – it’s safe, clean, and offers them the opportunity to experience so many cultures in their everyday life. There are also many great options for third-level education. Kids generally enjoy life in Toronto. Childcare is among the most expensive in Canada, however, and for infants it will cost an average of $1,758 per month. To find schooling, the website of the Toronto School Board will help you find out what options are available near you. The cultural diversity of Toronto ensures that eating out offers a multitude of choices for any and every budget. Almost all bars serve food, and it is common to start a night out with a meal as well as a few drinks. Each neighbourhood has its own selection of great places to eat, and there are many websites providing information on Toronto’s culinary scene, such as Dine.to, and Toronto.com, which provide ratings and recommendations. If there’s a particular restaurant that takes your fancy but appears out of your budget, wait until Summerlicious or Winterlicious roll around. These are set weeks each year (one in Summer, one in Winter) to promote Toronto’s hospitality industry where more than 200 restaurants across the city take part. The participating restaurants offer a prix-fixe menu for reduced prices. Toronto has a well-founded reputation for having a great bar and nightclub scene. There are many, many options and venues to suit all tastes. King West is home to many bars and typically has more of a young professional vibe, whereas the scene on Queen West tends to be more indie. The strip on Ossington, from Dundas Street down to Queen Street is another area with a host of options. The east end tends to be home to more local bars, as opposed to nightclubs which are typically in the downtown or western part of the city. The LGBT scene is centred around the Church & Wellesley intersection, with loads of bars and clubs to choose from. 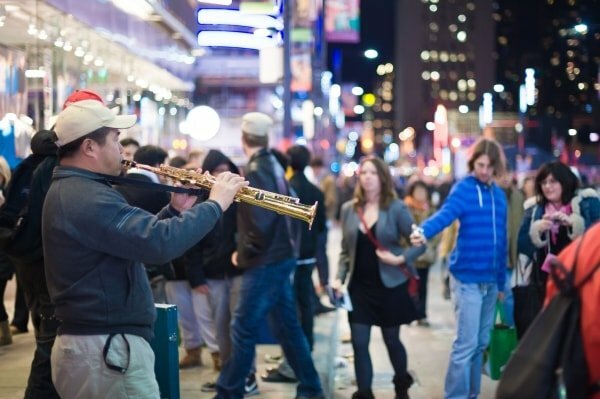 Closing time is 2.30 a.m., although there are many nights during the year when select bars get extended opening hours until 4 a.m.
A man plays music on busy Yonge Street during Nuit Blanche in Toronto. Caribana – Billed as the continent’s largest street festival, 1.3 million people celebrate Toronto’s rich Caribbean tradition every August on Lakeshore Boulevard and in Exhibition Place. Caribana is the centrepiece of Caribbean culture and life in Toronto. Taste of Little Italy – College Street is closed between Bathurst and Dufferin for this celebration of Italian food and music. Taste of the Danforth – Similar to its Italian counterpart, this east end street festival is an ode to the Greek community and its culture. Nuit Blanche – This annual all-night arts festival brings art to the streets of Toronto, which acts as a gallery in itself. VELD – Takes place uptown in Downsview Park, it caters for fans of dance and hip-hop. 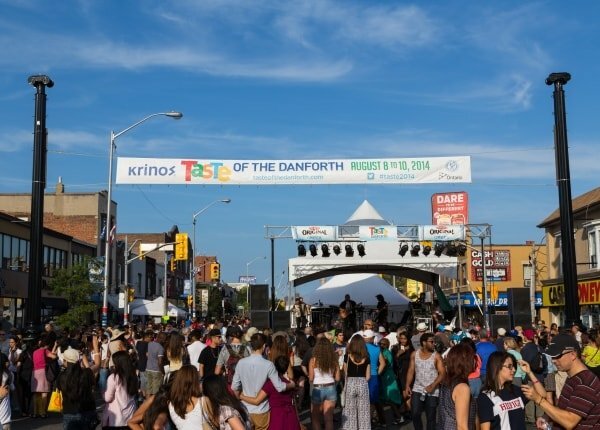 Taste of the Danforth showcases Greek culture and cuisine in Toronto’s east end. Biking is hugely popular for those living in Toronto, and it’s possible to bike year-round if you get the right winter gear. Much, though not all, of downtown has dedicated bike lanes. Be warned — if you’re done for breaking rules of the road on your bike you can actually get penalty points on your Ontario driver’s licence. Toronto has a great system of ravines where you can cycle for miles on bike paths, mostly running north-south. A cheap second-hand hand bike might set you back anything from $50 to $250 from a used bike store. An average new bike from, say, Canadian Tire, will cost around $150 to $300. A high-end bike from any of the trendy bike stores in town can go up into the thousands. If you are going to cycle in Toronto, get the proper gear. Invest in a helmet, front and rear lights, and proper brakes – and be careful of the streetcar tracks. This is an underground network of over 30 kilometres worth of shopping, services, and entertainment, and is the biggest underground shopping complex in the world. The network covers much of the downtown core and links to many subway stations and high-rise office blocks. It can be difficult for newcomers to navigate, however, so check out this map before exploring, as you can get lost. If you are able to master the PATH, it can make life in Toronto a bit easier in winter and it is useful for staying out of the cold downtown. Torontonians generally don’t fit the stereotype of the friendly, overly apologetic, Canadians that the rest of the world is used to. People here in Toronto will be first to tell you that. Being a part of such a big, bustling city, people get somewhat hardened after experiencing a bit of life in Toronto. That being said, the people of Toronto are still generally very nice, and it has a relaxed and very tolerant attitude most of the time. Many people in the city also identify very strongly with Toronto itself, rather than Canada as a nation. Toronto is much more diverse than other parts of Canada, and some minorities feel apathetic to the idea of Canadian identity but love their city. Also, be prepared to like Drake. The rapper is the city’s biggest advocate, and Torontonians are very proud of him. If you are negative about Drake, be prepared to be told you’re wrong! Want more help getting settled in Toronto? Life in Toronto can be amazing, but sometimes you need help settling in. Moving2Canada is here to help all those living in Toronto or planning to a move to the city. Explore our Moving to Toronto city guide. Find out where to live in our Toronto neighbourhoods guide. Read our guide on supermarkets in Toronto.